Vicki is currently a Scout Leader and Scout Active Support member in the Crawley district, she is also a member of the County Climbing team as a climbing and abseiling instructor. She has achieved both her Queen Scout Award and Gold DofE award, and she attended the 20th world scout jamboree, Thailand, as an Explorer Scout. Ann has been involved with Scouting for 15 years as a Scout Leader (in East and West Sussex), an Assistant Explorer Scout Leader (Young Leaders) and an Adult Training Advisor in Worthing District. During my time in Scouting, I have been lucky enough to have been to three World Scout Jamborees as a member of the International Service Team, in Thailand, the UK and Sweden. I have also had adventures in China and Switzerland as an adult leader and in Mexico as a participant at the 11th World Scout Moot. Sean has been involved in scouting for over 15 years as both a youth member and adult leader. 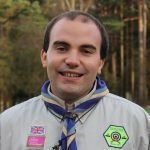 He is currently an Assistant Scout Leader at 2nd Ifield and District Youth Commissioner in Crawley District. He is also a senior instructor in the County Climbing/Abseiling Team and District Rifle Shooting instructor. He has completed all of the Duke of Edinburgh awards and Queen Scout Award. In his day to day job, Sean works as an IT/Technology Advisory Manager and Enterprise Architect for a large consultancy company based in London. Simon is currently an Explorer Scout Leader and an Assistant Scout Leader in the Horsham district. As a member of the County Caving team he has taken youth members on caving trips to the Mendips and local mines. He has previous international experience with his group and also parental experience of a Jamboree participant, as his daughter attended the last Jamboree in Japan.